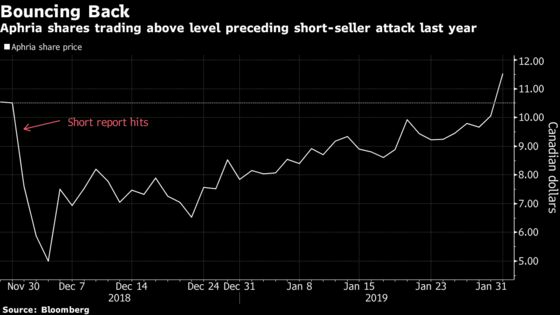 (Bloomberg) -- Aphria Inc. shares have recovered all the losses that followed a short-seller attack in early December. The stock was trading at C$11.44, a gain of 14 percent, at 3 p.m. in Toronto. The shares exceeded their Nov. 30 closing price of C$10.51 for the first time since short sellers Quintessential Capital Management and Hindenburg Research accused Aphria of buying assets from insiders at inflated prices. The stock lost more than half of its value in the three days following the short report. Aphria’s shares now trade at a 27 premium to the price Green Growth Brands Inc. has proposed to pay for the company in an unsolicited takeover bid. That’s the second-widest gap of 107 pending buyout deals tracked by Bloomberg. Short-seller Quintessential tweeted earlier this month that it’s “moving on to new projects” after Aphria CEO Vic Neufeld said he’d step down in the coming months.